Forfarshire 1st and 2nd XI both closed the 2017 season with comprehensive league wins. 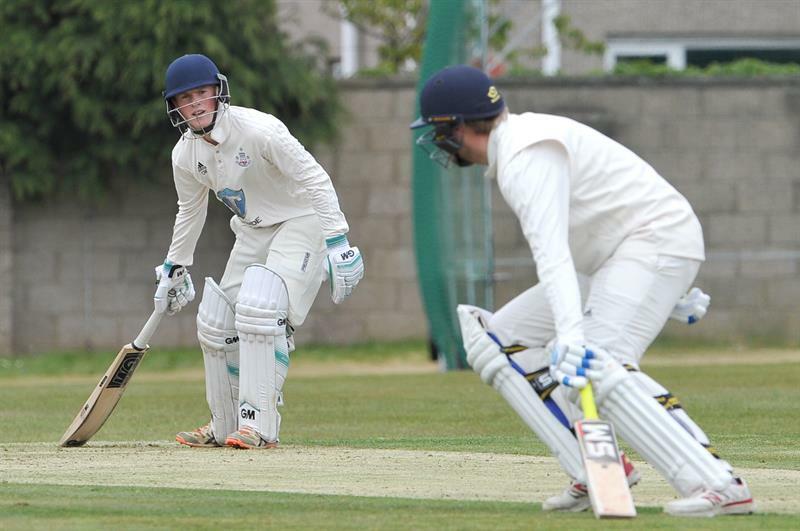 At Forthill, a maiden league century for Callum dominated the Forfarshire innings - his 101 not out coming from 146 balls and included ten 4s along the way. Wally (41 from 55 balls) joined Callum at 5 for 1 after Matty was bowled in the first over and between them added 88 for the second wicket when Wally was caught. An entertaining fourth wicket partnership of 113 between Chris (71 from 60 balls) and Callum kept the runs flowing as the Forfs passed 200, the partnership ending when Chris went down the wicket to Diedericks and was stumped. A quick 37 not out 21 balls from Scott saw Forfarshire post 289 for 5 after 50 overs. The SMRH reply started brightly but faltered when Wally took a gulley catch off Matt for the first of his 4 wickets and then Scott beat Miller to leave SMRH 48 for 2. Brock then ran through the remaining SMRH batsmen taking 5 for 33 to see Forfarshire end the season with a 180 run win. At St.Andrews, Forfarshire 2nd XI bowled out Kinloch for 93 then chased down the target with the loss of two wickets, Kye top scoring with 41 not out along with 31 not out from Hogi. Tayside Group Forfarshire lost a rain affected match at Grange Loan on Saturday (12th August) in what became a thrilling run chase after a revised target of 182 from 32 overs was set by Duckworth Lewis. Back at Mackays Forthill, Forfarshire 2nd XI overcame Perth Doo’cot by 39 runs. Choosing to bowl first, Scott sent Simpson’s middle stump flying in the third over before Forfarshire were handed the bonus wicket of Watts (36 from 59 balls) who attempted a quick single to Umair but was sent back by Herdman and left short of his ground. Pillai fell LBW to Umair then Beattie pulled a short ball from Andy to Christian who took a confident catch at deep square leg to leave Carlton 99 for 4 after 25 overs of their allocated 45. Scott troubled Herdman on a number of occasions but never found the edge he deserved, and eventually fell LBW to Umair for 53 from 76 balls. Shah hit 42 from 35 balls and Boyd 37 not out from 40 balls to bring the Carlton innings to life and see Carlton up to 217 for 8. Forfarshire reached 26 for 1 after 6 overs when rain stopped play and a revised target of 182 from 32 overs was set. Rory (50 from 66 balls) and Callum (44 from 65 balls) added 64 for the third wicket when Callum was runout trying to keep up with the challenging run rate. Greaves (21 from 16 balls) and Rory took 26 from two Herdman overs to keep Forfs in with a chance however 26 were needed from the last two overs and with Gossain conceding just 8 from his over and Evans returning to bowl the last, Forfarshire fell 10 runs short of victory. At Mackays Forthill, Forfarshire 2nd XI batted first with Will (53) and Howie (52) taking the score past 100 before both fell to McCreanor. Two further wickets for the same bowler and one for Saraal accounted for the middle order and Forfarshire 2nd XI were in danger of folding at 155 for 6. Midge, Glen and Gavin combined to ease the total past 200 but the innings concluded on 205 in the 42 over. Samir picked up an early wicket when Ali edged behind before Taylor (50) and Ferguson (22) settled in for the run chase. Will held a return catch from Ferguson and followed that by bowling Knoesen to bring the home side back into the game with Perth on 66 for 3 after 14 overs. Blackie and Howie then shared six wickets between them to account for the tail and bring about a 39 run victory. Forfarshire defeated current league champions Carlton at Mackays Forthill on Saturday (10th June) in front of a bumper crowd. Torrential rain through the previous week saw a delayed start reduce the match to 39 overs per side but this still provided much entertainment for the ‘Former Players’ that gathered for a day's reminiscing at Teds’s Shed. Asked to bat first, Matty (35 from 41 balls) drove the first ball to the boundary and along with Callum saw Forfarshire make comfortable progress until Callum edged Shoebridge to Boyd. The innings looked in little difficulty until Matty played across Shoebridge and was bowled to leave Forfs 55 for 2 in 15 overs. A third wicket for Shoebridge and another catch for Boyd, this time off Henderson, changed the situation and left Forfarshire on edge at 66 for 4 - but Umair along with Greaves (33 from 54 balls) steadied the innings until a direct hit runout saw Greaves short of his ground with the total on 113 for 5 just as the run rate was increasing. Christian (34 not out from 32 balls) immediately kept the runs flowing with a crucial partnership of 30 with Umair who hit 27 from 42 balls. Brock and Christian added 34 in the last 5 overs to take Forfarshire to a respectable 179 for 6 in 39 overs - Brock finishing on 17 not out. The Carlton response depended much on their top order, and Forfs were given an early boost when Christian found the edge of MacPherson’s bat and Callum dived to his right to hold a brilliant catch. A second wicket seemed hard to come by until Brock (2 for 13) and Callum combined to dismiss Beattie in the 12th over, caught down the leg side. Liam (2 for 32) replaced Christian and hit the stumps with the last ball of his first over to see Carlton 37 for 3. Herdman and Pillai looked a difficult partnership to break until Brock enticed Herdman down the wicket to offer Callum a stumping at 55 for 4. Two wickets in two balls for Umair (3 for 24) gave Forfarshire the upper hand and he was in the action again when a Shoebridge drive was sliced off Liam to Umar at cover. Blackie wrapped up an enthralling game with two wickets in the 35th over to secure a Forfarshire victory by 53 runs. Forfarshire 2nd XI v Perth Doo’cot was cancelled due to rain, and Sunday’s 3rd XI visit from Stoneywood-Dyce XI was abandoned with Forfarshire 3rd XI on 29 for 4. Don’t forget that match reports from previous 3rd XI games can be found here, and full game footage from Forfarshire v Carlton is available here. Tayside Group Forfarshire won through to the semi-finals of the Caledonia Murgitroyd T20 Knockout on Sunday with a 47-run win over Stoneywood-Dyce. Forfarshire lost wickets regularly during the early part of their innings and at 87 for 5 from 12 overs a good finish to the 20 was needed - and Scott provided that with a 36 ball innings of 57 not out to elevate the Forfs total to 147 for 8. Christian struck twice in quick succession when Forfs took to the field, first holding a well struck caught and bowled chance then finding an edge that flew to Callum. Two wickets for Blackie then helped to secure a comfortable 47-run victory, Stoneywood-Dyce closing on 100 for 6. Forfarshire 4th XI kicked off their season with a high-scoring win over Montrose at Mackays Forthill on Sunday. Morgan (55) and James (29) added 60 for the first wicket before 53 on debut from Nigel and 40 from skipper Greig took Forfarshire to within sight of 200 before Blair (29no) and second debutant Garry (17no) chipped in to round off the innings on 235 for 5. Montrose got off to a promising start however Lewis bowled dangerman Christie with the total on 50 in a spell of 3 for 10. Blair completed a good days work with 3 for 45 that helped restrict Montrose to 161 for 8 after 40 overs. Forfarshire 3rd XI won an exciting Two Counties Cup match against Glenrothes XI at Gilvenbank Park on Thursday night (25th May). Batting first, a quick 26 from Midge at the top of the order saw Forfarshire reach 41 for 2 after six overs when he was unfortunate to be bowled off his pads. A further three quick wickets left Forfarshire struggling at 47 for 5 however Clark (27) and Andy (17) recovered the situation with a 50-run partnership that took the final total to 121 for 7. 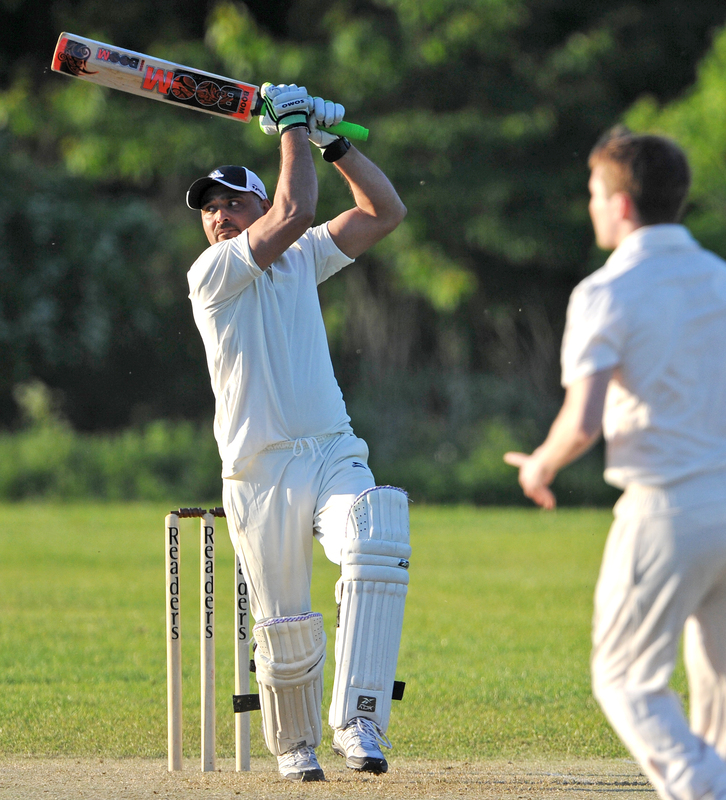 Glenrothes opener Khan took no time to signal his intentions, launching Kailas for a four and a six in the first over. Andy was given similar aggressive treatment that left Forfarshire reeling as the home 50 came up in the fifth over. Rojo removed the dangerman, bowled for 46 in the eighth over, but still Glenrothes looked in little difficulty at 80 for 1 in the 11th over. A stumping by Midge off Rojo came in the 12th over then a double wicket maiden from Ted changed the mood in the middle and Forfarshire sensed the game was back on. Blair claimed the big wicket of opener Dodds for 33 and along with a well effected run out by Morgan to Midge, Glenrothes slumped to 101 for 7. Two wickets in two balls by Andy all but wrapped up the game in the 19th over before Blair claimed the last wicket in the 20th over to see Forfarshire win by 17 runs. Forfarshire were on the wrong end of a record breaking Eastern Premier League match at Mackays Forthill on Saturday (29th April) - the 682 runs scored being the highest aggregate score in the history of the EPL. Asked to bat first, Matty (87 from 76 balls) punished the visiting attack in the early overs hitting 13 boundaries in a dominant opening partnership with Callum (90 from 107 balls). Forfarshire passed 150 in the 23rd over and it took a direct hit from a runout off a free-hit due to insufficient players outside the 30-yard circle to separate the pair with the total on 167. Callum looked set for a comfortable century when Shorten hit him in front to end a well constructed innings on 90. Rojo got off the mark with a scoop shot to fine leg and quickly accelerated the run rate which had slowed after Greaves lobbed a catch to cover. Rojo (68 not out from 50 balls) and Umair (45 from 43 balls) added 102 in the last 13 overs to elevate the Forfarshire total to 340 for 4 after 50 overs. 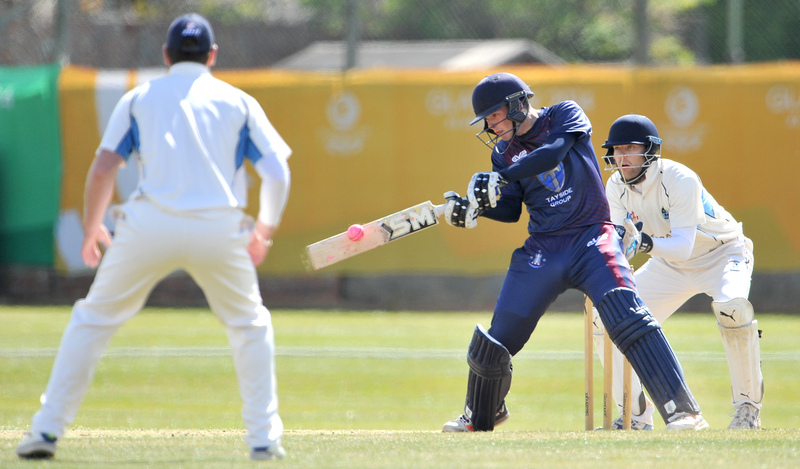 The Aberdeenshire openers wasted no time in making their intentions known and after 20 overs were 147 for no wicket. Brock held a high catch at mid-off in Christian’s 2nd over to dismiss Reid for 69 (65 balls) while a sharp caught and bowled by Umair undid Venske for 99 from 84 balls. This set the scene for Aberdeenshire pro Ngoepe to mark his arrival with a superb 109 not out on debut and take the visitors to a 5 wicket win in the 47th over. A successful series of warm-up games concluded yesterday with Forfarshire winning at Arbroath and the 3rd XI winning at Mackays Forthill against Glenrothes 3rd XI. Batting first at Lochlands, an excellent 103 from Callum along with Umair (43), Brock (31) and 30 from Matty in opening partnership of 60 saw Forfarshire post a healthy 268-9 from 50 overs. A wicket apiece for Liam and Scott with the total on 16 removed both Arbroath openers before 39 each from Waller and Cameron took the home side to 104 for 4 in the 28th over. Two wickets for Christian followed by three from Umair wrapped up the game as Arbroath finished on 170 for 9. Back at Mackays Forthill, a half-century from Cameron along with 32 from Lewis saw the 3rd XI off to a good start. Harry hit 26 before claiming 3 for 6 in the second innings that also saw three wickets hauls for Ted and James, Glenrothes being bowled out for 112. Saturday saw the traditional Captains XI v Presidents XI match, and a fine century from Rory (103 from 77 balls) led the Captains XI to a 7 wicket win chasing down the Presidents XI’s 220 for 7.